NFPS facilitated the application for and the administration of the Small Cities Community Development Block Grant (CDBG) on behalf of the Town of Fort White. The grant application was submitted to make necessary upgrades and improvements to the Town’s existing water treatment facility. The Town was awarded $650,000.00 to complete this project through CDBG Neighborhood Revitalization. 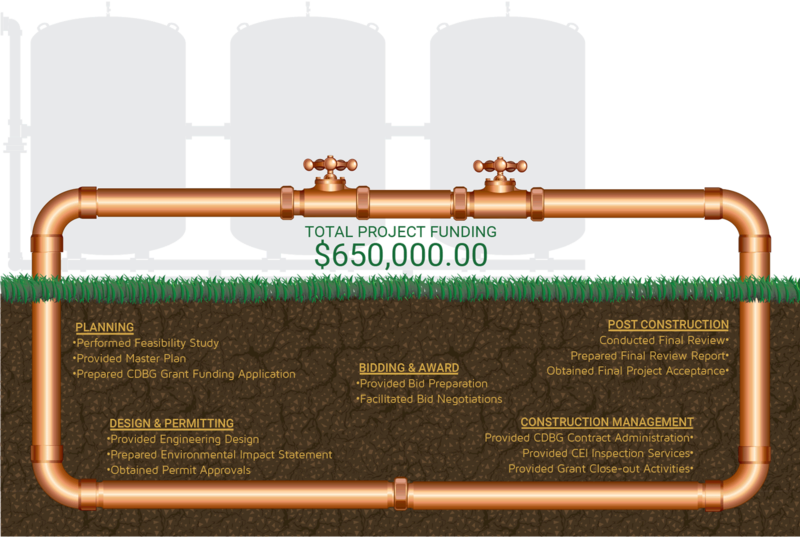 This project included repairs of two of the ground storage tanks used to store potable water. These needed repairs were identified per a Florida Department of Environmental Protection required inspection report: the replacement of the Programmable Logic Controller (PLC), repairs to the Permanganate Storage Tank, and installation of two (2) permanent shelters (per specifications) approximately 14′ x 28′ each over the treatment filter systems. A 1,000 GPM fire water pump was also installed as was recommended by the Florida Rural Water Association, a third raw water well as well as a 430 SF pump house with lab and restroom facilities. NFPS handled both the design and Construction Engineering Inspection (CEI) aspects of this project in addition to the grant administration.